This Easy Caramel Tarts recipe will become your new go to dessert! Ok, so there isn’t a lot (or any!) 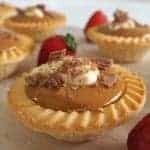 cooking involved in this easy Caramel Tarts recipe, but what if lacks in cooking steps, it sure makes up for it when it comes to being a quick, simple and most importantly delicious dessert! It’s best to leave these easy Caramel Tarts to chill in the fridge for an hour or so before eating, but I would highly recommend that you enjoy them within a day of making them, as the pastry may begin to go a little soft. These easy Caramel Tarts could not be more simple to make - or eat! Remove the mini pastry tart shells from their foil containers and place onto your serving plate. Place the thickened cream, icing sugar and vanilla extract into a bowl and use a hand mixer to whisk together until soft peaks form. Place into the fridge until needed. Pour the Caramel Top n Fill into a bowl and whisk until smooth. Place a small dollop of whipped cream on top of each tart and sprinkle with pieces of the Flake bar. Place the Caramel Tarts into the fridge to chill for one hour before serving. These Caramel Tarts are best served the day or day after they are made. You can also find more great easy recipes in our print and ebook collection – visit the shop here. Thanks for this..it looks great!